With Steam OS now delayed until 2015 PiixL, the designers of the highly anticipated Jetpack, have decided to shift into high gear to introduce now their Windows-based Steam Machine, the new G-Pack. G-pack, designed for those that want the ultimate home-entertainment experience, is entirely based on the same hardware platform as Jetpack but runs Steam’s “Big Picture”, which is essentially Steam OS on Windows. G-Pack retains the high performance yet invisible key characteristics of PiixL’s ground breaking design that created a lot of excitement earlier this year, whilst benefiting from updates across the board in-line with the new machine’s OS. The OS and Software are where the biggest changes occur. PiixL have thoroughly tweaked both Steam’s “Big Picture” mode and Windows for the 10-feet interface, details of which will be fully released in the coming days, but expect full Gamepad control for both gaming and media, and a true one-touch experience from standby to entertainment. Of course, being Windows-based, G-Pack runs all the games currently available on PCs, and supports virtually any PC features and hardware. 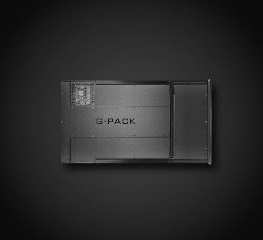 Despite being a full-on x86 gaming machine, G-Pack’s design concept makes it both ultra-thin and nearly invisible in any living-room. The sleek design enables G-Pack to be directly mounted between any TV and wall bracket via their VESA Flat Display Mounting Interface. Moreover, G-Pack’s clever extendable chassis lets it extend in width to give unhindered access to all physical controls and storage media, right at the edge of any display from 32” to 70” in size. Finally, the G-Pack chassis has been improved for easier user upgradeability and supports virtually all GPUs and ITX motherboards available on the market today within a combined thermal envelope of 500 watts. The machine has been extensively tested over the past two years, and with the ramp up of production capacities now complete, PiixL will launch this ground breaking gaming machine on Kickstarter end of July, so stay tuned!